Suzuki Motor Corporation is pleased to announce the domestic launch of the Palette, a new wagon-type minicar that combines interior spaciousness with superior easiness to step in and out of the vehicle and superior luggage-carrying capability. 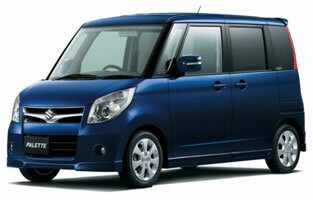 The Palette is available from Suzuki dealers in Japan from 30 January 2008. The Palette is a new kind of miniwagon in which the inherently superior economy and user-friendliness of a Suzuki minivehicle are combined with revolutionary, space-liberating packaging and with innovations that realize huge versatility. Offering new possibilities for diverse lifestyles, it forms the third pillar of Suzuki's miniwagon lineup alongside the Wagon R (the model with which Suzuki pioneered the miniwagon category) and the MR Wagon* (a model that's packed with functionality and equipment to meet users' needs). A tall body with a long roofline creates ample space for four adults in the Palette. Wraparound glass surfaces give occupants an excellent view. And the cabin offers lounge-like comfort and quality together with the benefits of noise- and vibration-suppressing technologies. The overall result is an interior environment that's roomy, refined, and quiet. Sliding rear doors that allow passengers to enter and exit on either side are combined with low steps for remarkably smooth movement and day-to-day convenience. Also, a newly developed low-floor platform and a rear seat that can folded into the floor realize a capacious luggage area with a large opening. Suzuki targets monthly sales of 6,000 units. The exterior design makes the Palette look large and spacious. The interior design combines roominess with comfort. A long wheelbase of 2,400mm and an interior length of 2,025mm help to create ample space for four adults. Sliding left and right rear doors each allow easy entry and exit through an opening that's 580mm wide and 1,230mm tall. A low-floor platform helps to realize a capacious luggage area with an opening that's 985mm wide and 1,100mm tall. A rear seat that can be folded into the floor allows the cabin to be configured for diverse passenger- and luggage-carrying needs. Driver and passenger SRS airbags, a light, shock-absorbent Total Effective Control Technology (TECT) body, and an antilock braking system (ABS) with electronic braking-force distribution (EBD) and a brake-assist function provide protection.